470 Stephens Hall is the main research and meeting area for the Center. We recently re-configured the room to satisfy the needs of our many users—graduate students, visiting scholars, and visiting student researchers for independent study, and groups who come in small numbers as well as those who gather for Colloquia, courses, and occasional conferences. 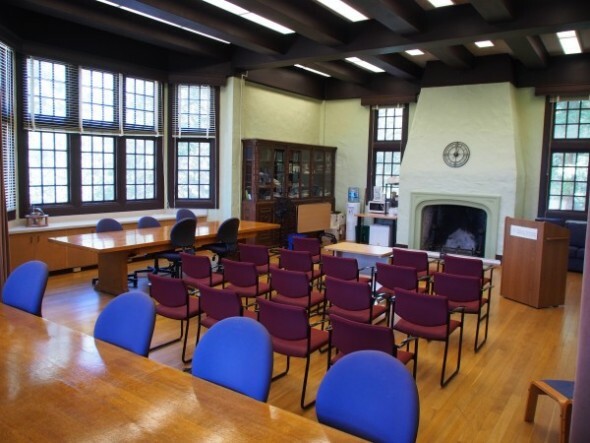 University of California groups may request Room 470 Stephens Hall for various events including lectures, research workshops, colloquia, luncheons, and receptions. Please see our facilities page for more information. This is when PhD Students and Visiting Scholars use the room for quiet study. People are asked not to engage in conversation either with others in the room or on the phone, and promote an environment where others can also work. Meetings, when they occur, should be behind the curtain and remain in hushed tones. CSTMS Students and Scholars who use the room on a regular basis may get a key from the main office, 543 Stephens Hall. Those affiliated with the Center are welcome to plan reading groups at either the large table, small table, or other small groupings. If some folks want to work and others have a meeting, the curtain can be drawn to separate the studiers from the conversation. Feel free to draw the drape or ask the group to be in one part of the room or another so that both activities can take place simultaneously. CSTMS endeavors to offer different forums for intellectual exchange: The Working Group meetings offer a venue for local and visiting scholars to meet and share their work through presentations and roundtable discussions. On Thursdays, the room is used for our Colloquium series, which are formal talks by invited guests, and are open to the public.